New York City's cab drivers want to charge passengers a small additional fee to cover the rising price of fuel even though regulators have rejected such efforts in the past. Cities such as Chicago, Washington, D.C., Philadelphia, Las Vegas and Miami have either recently allowed cabbies to begin levying fuel surcharges or are considering allowing them. In New York City, which has the nation's largest taxi fleet at 13,237 vehicles, fuel surcharges have long been a touchy issue. The Taxi and Limousine Commission balked at demands from drivers in 2008 for an additional fee. Some drivers even demonstrated in 2008 in front of the commission's offices. Cabbies are asking for the fee today to offset the rapidly rising cost of gas. 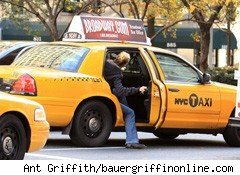 New York has not raised its cab fares since 2004, and has not approved a fuel surcharge in recent memory. "It is hurting a lot," says Javid Tariq, co-founder of the New York Taxi Workers Alliance. "Our incomes are getting squeezed." Sergio Rodriguez of the New York State Federation of Taxi Drivers agrees, telling DailyFinance: "I think that it's something that should be studied .... We have a board meeting Thursday and I am sure it's going to come up." A typical New York City driver earns between $150 and $200 on a good day, and probably spends about $240 to $280 a week on fuel, he says. A spokesman for the TLC, Allan J. Fromberg, says a fuel surcharge is not under consideration because the industry has not requested it. In previous years, the extra fee was unwarranted because a "certain amount of flexibility" was built into the fare, he said. Similar sentiments were echoed by officials in San Francisco and Boston. "We have not [considered a surcharge] and there are no immediate plans to do so, at this point," wrote Paul Rose, spokesman for the San Francisco Metropolitan Transit Agency, in an email. Dedrick Stephens, Cleveland's Licenses and Assessments Commissioner, said in a statement to DailyFinance that the city will continue to monitor how gas prices perform. There is currently no surcharge in the city. Regulators in Nevada. who oversee cabs in Las Vegas, are mulling the idea as are officials in Charlestown, S.C., according to media reports. Earlier this month, the Energy Information Administration (EIA) projected further increases in the retail price of unleaded gasoline because it did not reflect the recent gains in the price of oil. The EIA expects prices to average $3.56 per gallon in 2011, 77 cents per gallon higher than 2010 and about 40 cents above its earlier estimates. The higher prices are forcing the taxi industry and regulators to strike a balance between protecting drivers from financial hardship and preventing fares from rising so fast that they drive away customers and add to traffic congestion. "That's why we rely on the drivers to help us make the call," says Jim Ney, who oversees the regulation of about 1,600 taxis for the Philadelphia Parking Authority, which will discuss fuel surcharges at a public meeting next month. One Phoenix cabbie told TV station KTAR that his fuel costs were up 15% to 20%, and the only way he could make up the difference was to work 14 hour days. Officials from the Arizona Department of Weights and Measures, which regulates taxis in the state, could not be reached for comment. Drivers in cities where additional levies have been approved have hardly hit the jackpot. Cabbies in Miami were allowed to add an additional $1 to fares starting this week to cover the rising gas costs, according to the Miami-Dade Consumer Services Department. The surcharge was approved because gas prices have remained above $3.50 a gallon for three straight weeks, according to EIA data. Washington Mayor Vincent Gray signed an executive order over the weekend allowing a $1 surcharge until at least July. Chicago officials approved a $1 surcharge on cab fares in January, up from 50 cents. It's not a lot, but for cabbies trying to make ends meet, every additional dollar helps. *Story was updated to clarify details about gas surcharges in New York.